GERMANY: Siemens is developing a system of storing thermal energy in rocks with the aim of using it to harness excess power from wind turbines. A spokesperson told Windpower Monthly that the project is in the early stages of development and there is no specific timescale for the construction of a prototype of the system. He said the system would be scaleable for use on site at different projects. The company was unwilling to reveal specific technical details about the process, but said it relied on established technology. The storage of heat in rocks has been used as a method of energy retention for some time. But Siemens' system will transform the stored thermal energy back into electricity rather than use it for heating. This would be done in a "conventional manner" the spokesperson said. The captured heat would be used to create steam to generate electricity through steam turbines. In an inteview with Windpower Monthly, Henrik Stiesdal first revealed that Siemens was developing the system: "Among the things I have worked on in the later years is a new thermal energy storage concept. Being able to store wind electricity could be the missing link, and I'd like to follow up on that." 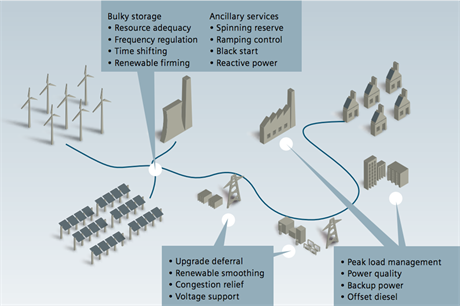 Siemens has already developed a grid-scale battery-based storage system. The Seistorage technology is modular and can be combined to have a power of 20MW and a storage capacity of 20MWh. Last year, the company also signed up with battery developer Aquion Energy to jointly develop storage systems that would aid the greater integration of renewable energies.